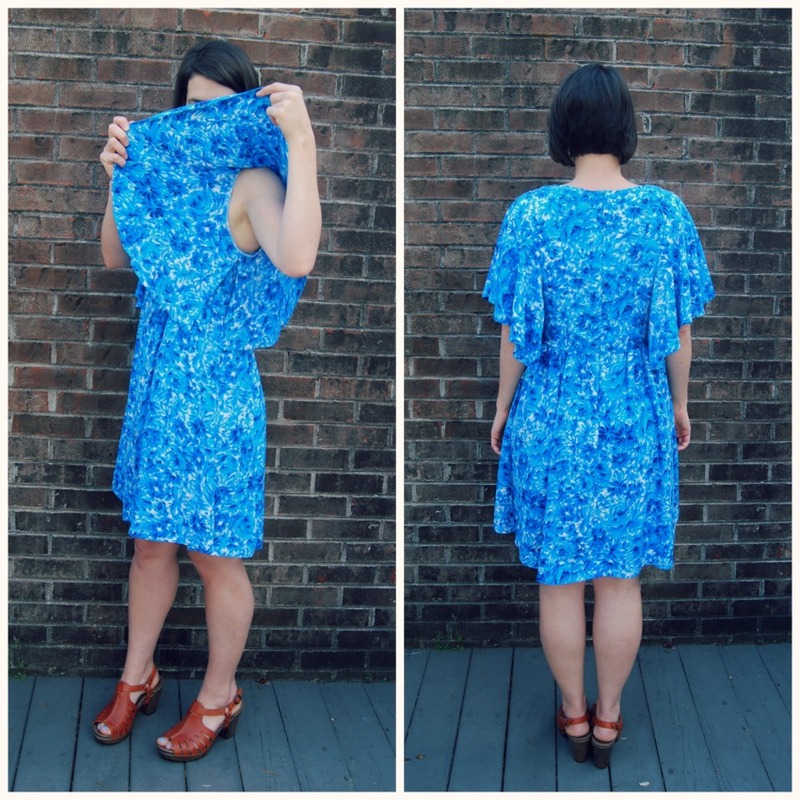 Pattern Description: The Fringe Dress from Chalk and Notch Patterns. I don't normally purchase pdf's, but I decided this one was worth it. And it was. I made my first version (the black floral one) two days before Easter in a mad dash because I had nothing that fit my lumpy postpartum body. 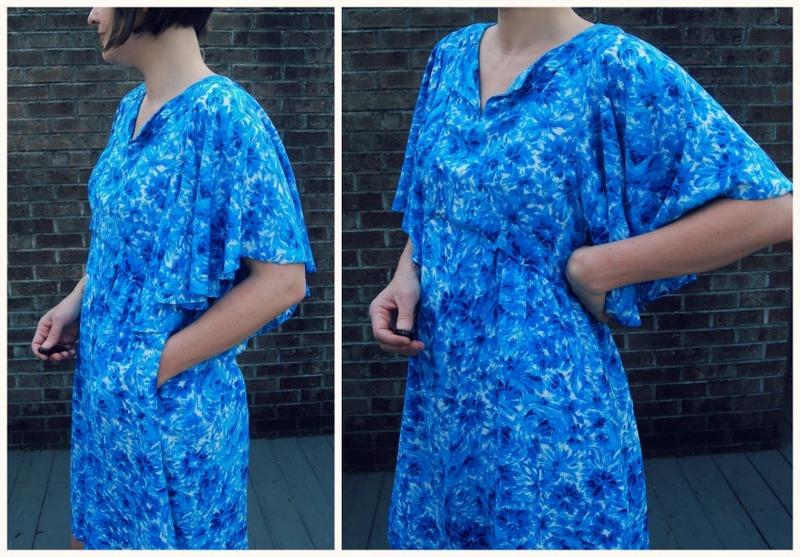 It's a perfect nursing dress with the front button closure. I liked my black floral one so much that I immediately cut out the orange and blue zig zag version. I only recently made the blue and white stripe goldfish version with some changes, and I don't love it. It's currently on the chopping block. It might become a top. 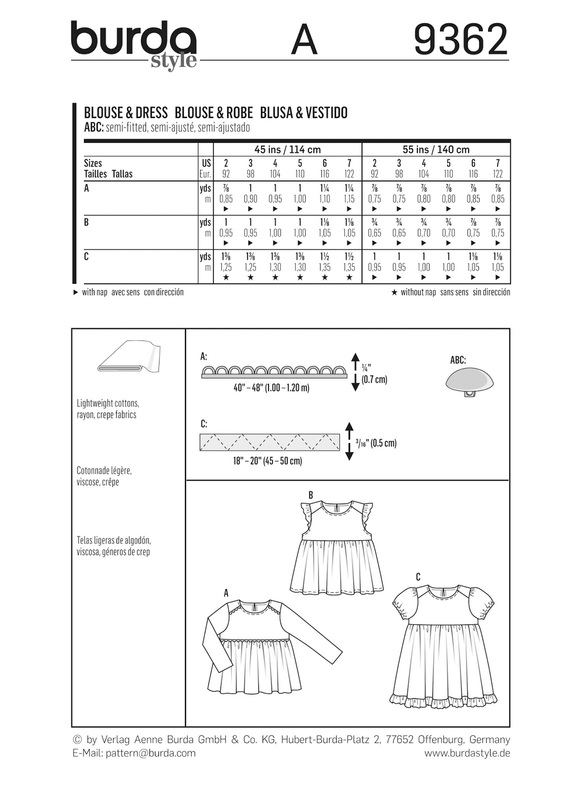 Pattern Sizing: Pattern comes in sizes 0-18. I made a 10, which lined up with my bust measurement but not my waist measurement at the moment I gave myself a little more seam allowance at the bottom of the bodice just in case, but I don't think I needed it since the bottom of the bodice hits very high on me. And as an aside, I'm definitely in the midst of the normal postpartum body struggles since I had a baby five months ago. I'm at that point where I really don't know what size I am and nothing fits. And being a second baby, I feel like the weight is just hanging on for dear life. I'm still nursing, though, and I've decided to be kind to myself until I'm done nursing. I'm sucking in like a champ in these photos. Ha! Fabric Used: The black floral version and the blue and white stripe goldfish print are both rayon poplin from fabric.com. It's one of my favorite fabrics to work with. The orange and blue zig zag print is a rayon I bought from Hancock right before they closed down. 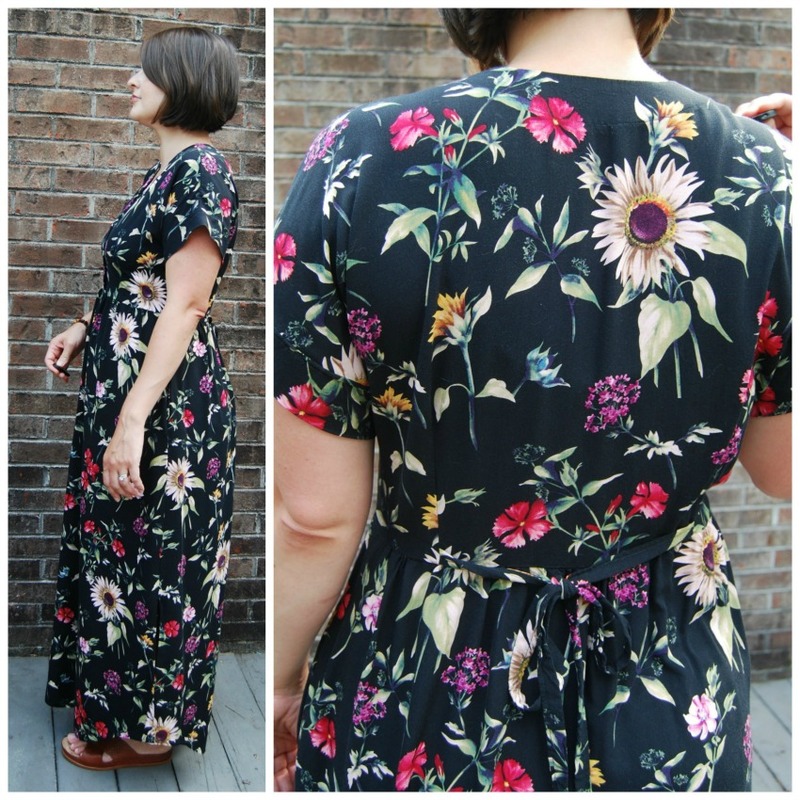 Alterations/Deviations: I lengthened the black floral version to a maxi after reading the tutorial on the Chalk and Notch site. No other changes. The bodice hit me just under my bust line, so on my second version I added about 5/8" to the bodice. 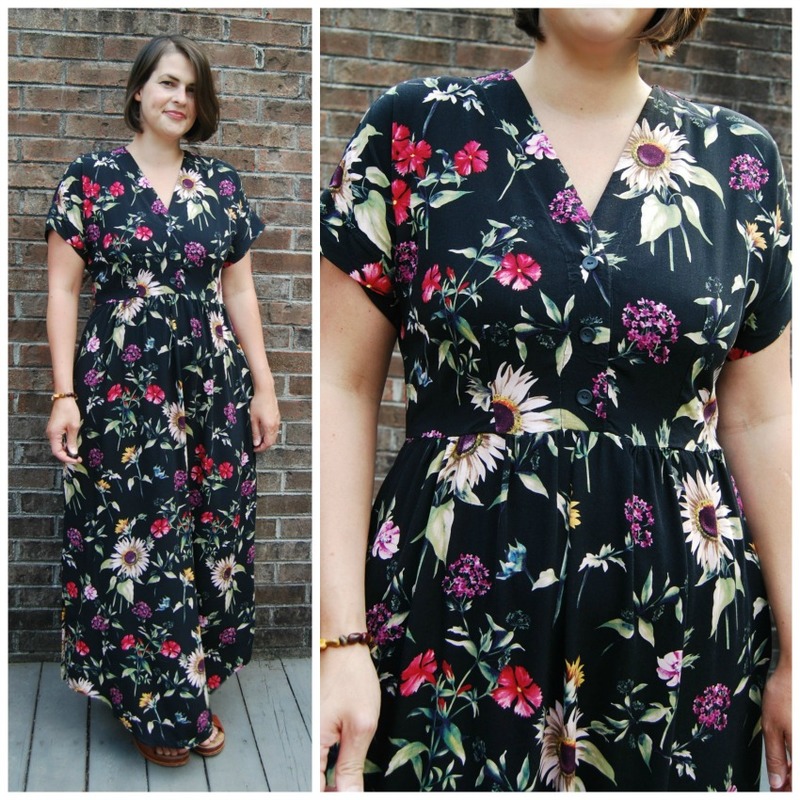 After looking at pictures, I can't decide if I like the longer bodice or not, but I do get a slight maternity vibe from the black floral dress. For the last version, I roughly went up a size by adding to seam allowances when I cut the fabric. Not the proper way to do it, I know, and I just eye-balled it. I thought I wanted a more relaxed fit. 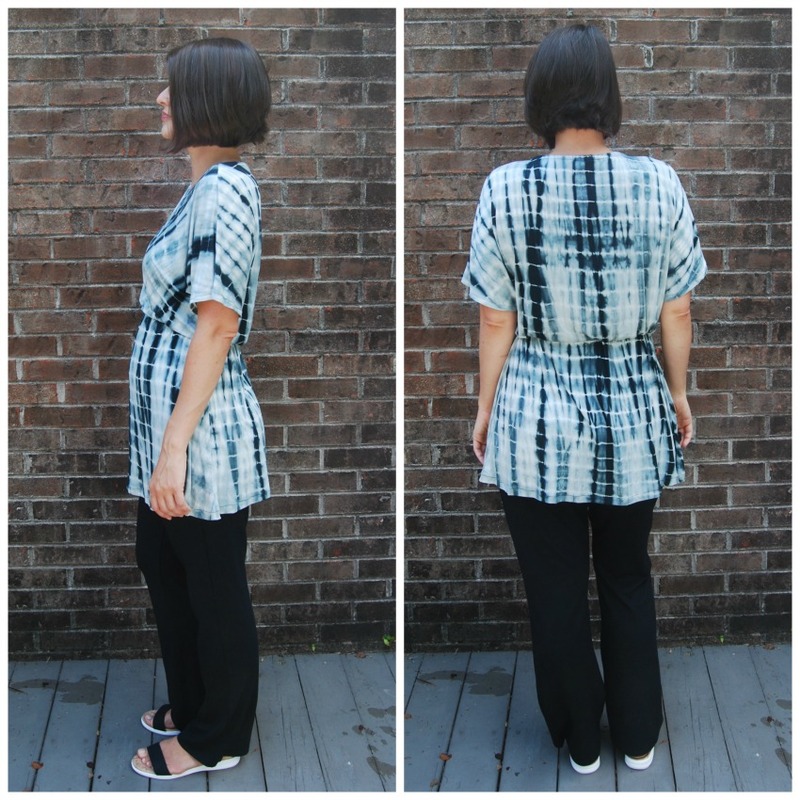 I also added some more width to the the hem line by pivoting from the back and center front. So the skirt has a bit more flare. All three versions I did the button front because I'm nursing a baby. I did the elbow sleeve and sleeve tabs on the orange and blue version, which is a nice design feature. I put the ties on the first two but left them off the goldfish version. Likes/Dislikes: The pattern is great. 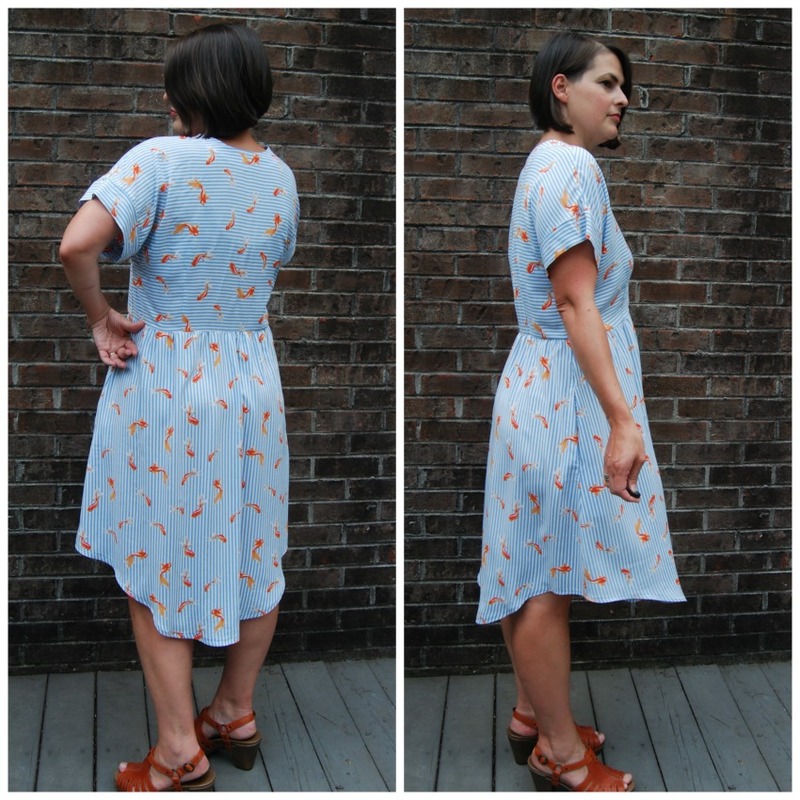 The design is really easy to wear and like I said before, it's a great dress for nursing moms. The fit is really spot on according to my measurements, though having the higher waistline helps. I wore my first two versions weekly when I went back to work at the end of the school year and they made me feel good and like I actually had myself together, even though I sure didn't! I love the black maxi version the best. In fact, I'm thinking about making another maxi version before school starts back again in a couple of weeks. I like the orange and blue version a lot, too. I spent forever on pattern placement. I actually had the back piece cut horizontally like the front but discovered I had a slight tilt when I started sewing it together. I had just enough fabric to go back and cut the back bodice the other direction instead. I knew having one side that didn't match up would drive me nuts. I'm not in love with the blue and white stripe goldfish version. Even thought the fabric is supposedly the same substrate as the black floral, it's much thinner and lighter weight. It's slightly see-through, too, so I'll have to wear a slip to wear it to work. I'm also not a fan of the more relaxed fit, although that could have something to do with the fact that I added to the size just by winging it. I think it's going to get chopped shorter and become a top. I also have some pulling at that first button that I need to try and fix. Conclusion: Great wearable dress! Skims over my lumpy, post partum mid-section and cinches in the smallest part of my waist. As much as I hate taping together pdf's, this one was worth it! Side note: Baby! I haven't been on here much (ummm, last October) but for a very good reason. I can't go without mentioning the new little brother in town, baby B. He was born February 15th and is just the perfect missing piece to our family. I have really been soaking up this time with him, especially since I wasn't sure we'd ever get to have that missing member of our family. I'm not sure how many people are out there still reading my blog after all this time, but if you recall, my husband has chronic myeloid leukemia. He was diagnosed shortly after our daughter was born five years ago. With the crazy medication he takes, we weren't sure we'd be able to add to our family. But long story short, we did :). And he's here. And we are just so lucky! I don't post much here anymore (obviously) and I skim through my blog roll only occasionally when I get a chance. I do, however, spend more time on Instagram. In fact, I find that most of my blog reading comes from following a link from Instagram these days. I like that I can click through to get the whole story since Instagram is really just a quick snippet. So if you are on Instagram and I don't follow you yet, give me a shout. My account is lizajanesews. This year, Jane was a lot more opinionated about what she wanted to be for Halloween. 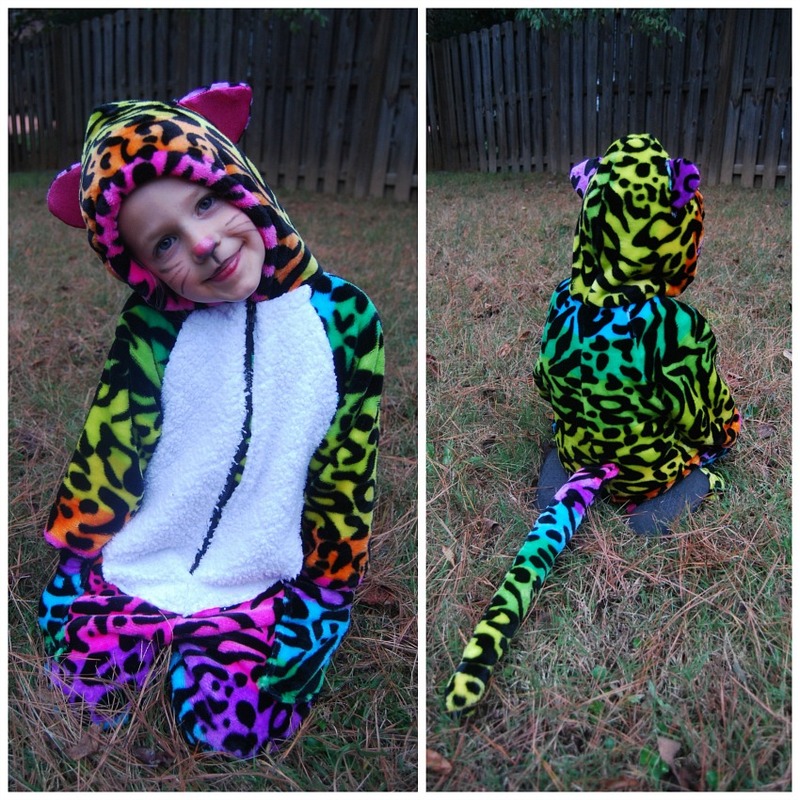 Although the idea to be her rainbow leopard Beanie Boo came about kind of organically. I started asking her what she wanted to be about two months ago. First it was a duck. Then a tiger. Then a fox, which she settled on for a while. 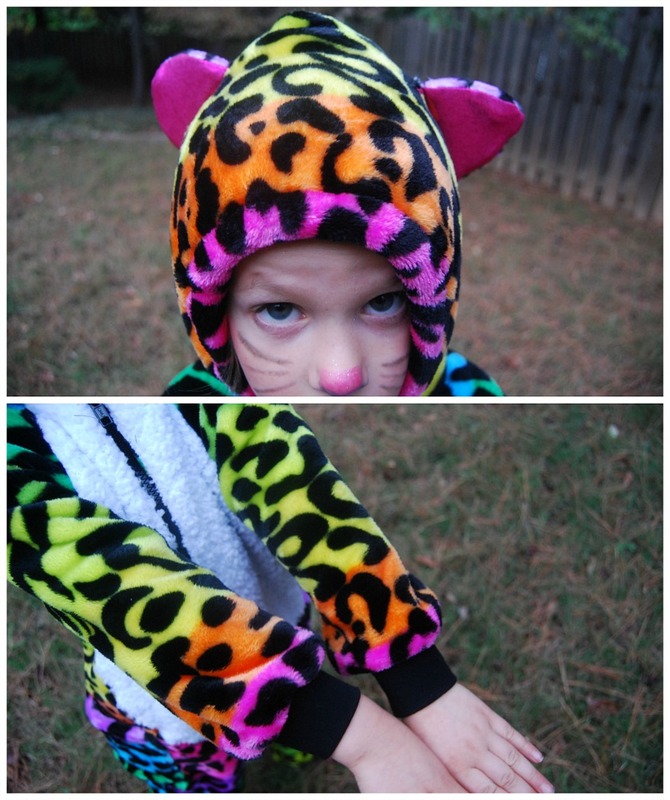 I'm thankful she asked for animal costumes because they are fun to make. I figured a fox would be a cute costume. So I started talking about buying orange fabric for her fox costume. Well. That was when the floodgate of ideas of opened up. She didn't want to be an orange fox. 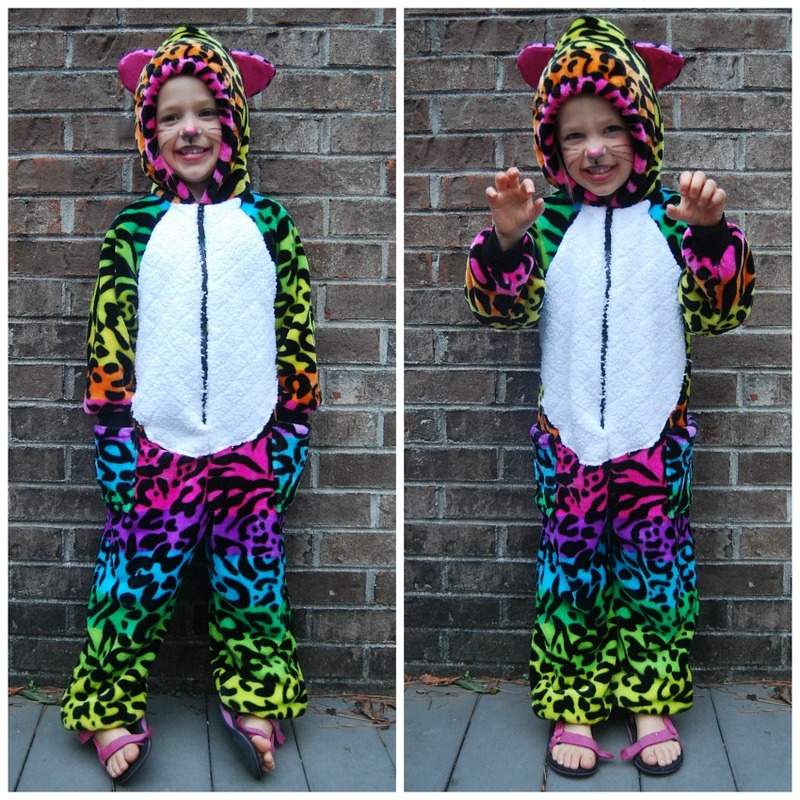 She wanted to be a pink fox, then a purple fox, and so on and so forth (the animal changed multiple times, too) until she settled on a rainbow fox (with spots and stripes and sparkles). 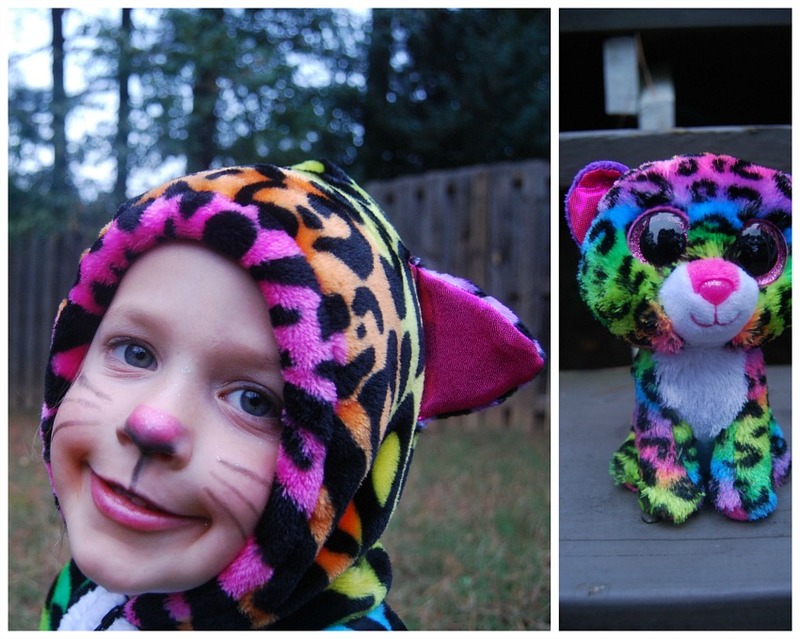 While talking about the rainbow fur with spots and stripes and sparkles, we had a revelation that she was really talking about her rainbow leopard Beanie Boo, Dotty. And that was that. I searched online for "rainbow animal print fabric with spots and stripes" and found this awesome fleece blanket on Amazon. I told her that once I ordered the blanket, that was it. She wasn't allowed to change her mind or give any more suggestions, which luckily she didn't. Anyway, I used Simplicity 1731, a pattern for an adult, child and DOG jumpsuit. 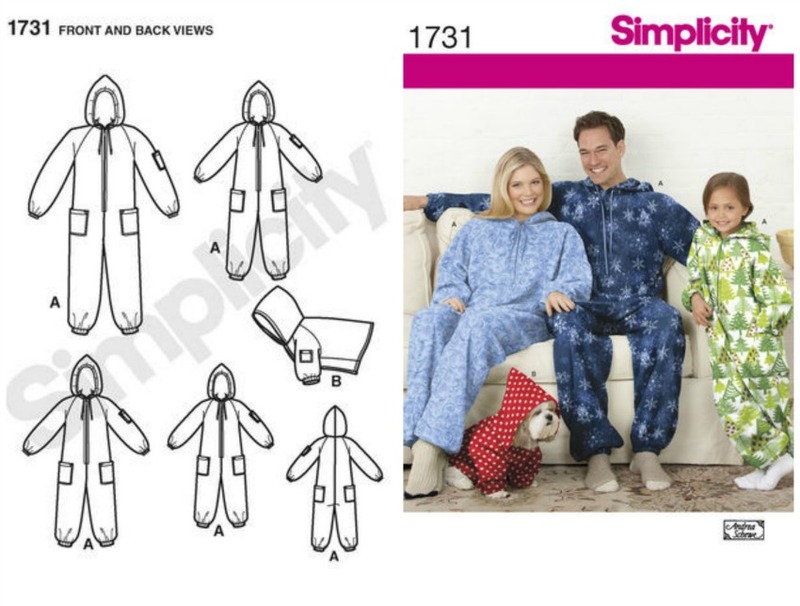 Just in case you wanted to make the whole family matching onesies. I honestly want to make myself a fleece onesie that will accommodate my pregnant belly this winter. I am serious. The pattern is great. 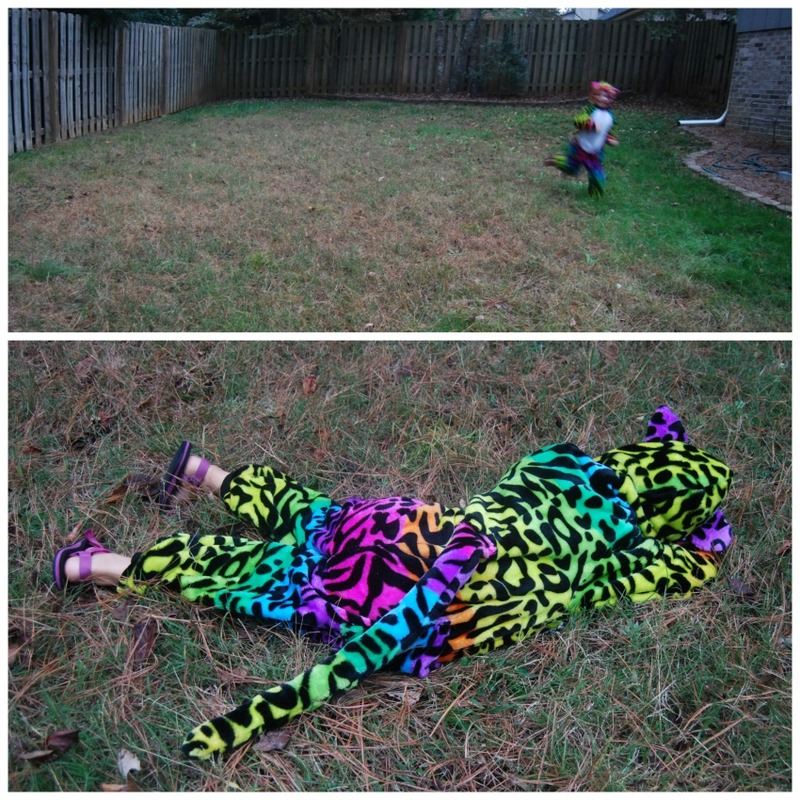 I measured the length against a set of footie pajamas that Jane wears all the time. The length was exactly the same (I used the child's size XS/4-5) as her pajamas but there was a ton more width. After getting the fleece blanket in the mail, I decided not to narrow any of the width down due to the blanket being so incredibly fluffy. 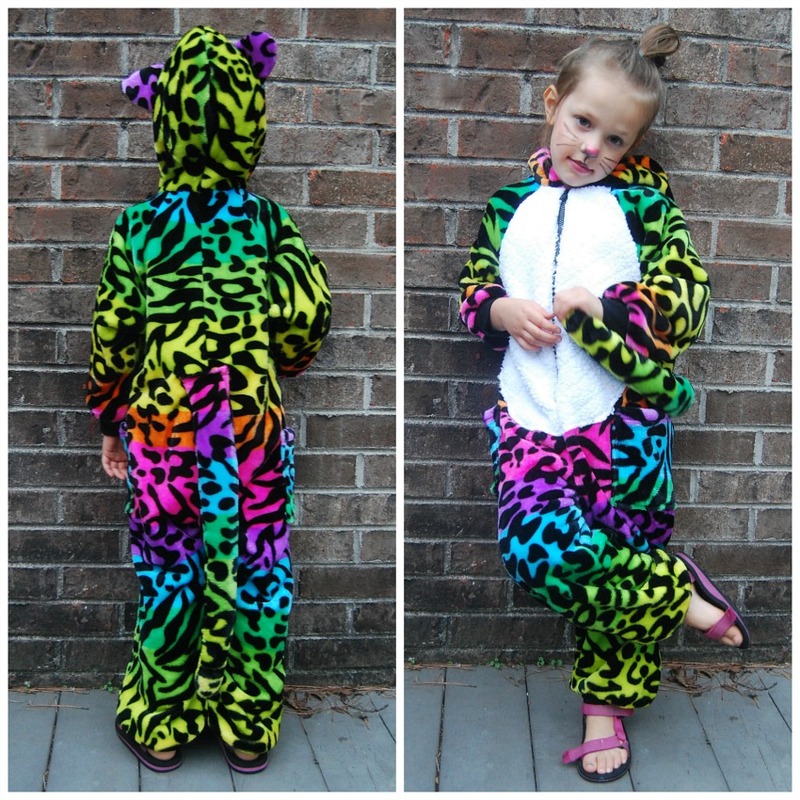 The rainbow fleece isn't a typical fleece, it's more like faux fur. It has a super deep fluffy pile on both sides of the fabric. It was a pain to cut, a pain to sew and a huge pain to clean up later on. It shed something fierce while cutting and sewing. There was rainbow fluff everywhere. It would fly up in the air and then settle all over everything like rainbow snow. I found it all over the house. It was all over one of our cats at one point. I am pretty sure I inhaled some of it. I sewed everything with a zig zag stitch and serged seam allowances to reduce some of the bulk. I really had to pull the fabric through my machine due to the pile being so fluffy. I made a couple of small changes while sewing. I rounded off the back of the hood. And, of course, added the ears, tail and white belly. The double layer of fleece at the belly was way too thick to install a zipper, so I had to sew it along the seam line and trim off the allowance of the white fleece. The white fleece is leftover from her kitty costume from three years ago! I also sewed on cuffs at the ankles and wrists instead of using elastic. I used some scraps of black bamboo knit. I did shorten the sleeves a teeny bit but the legs are the length per the pattern. The tail is stuffed with a little bit of poly-fil. And we found almost the exact same shiny pink fabric for the front of the ears. She loves it! And I love it. She's like a big, snuggly stuffed animal when she's wearing it. She's been wearing it around the house and actually wore it out to a restaurant to meet her grandparents the other day. And thank goodness it will be cold on Halloween this year because this thing is warm. 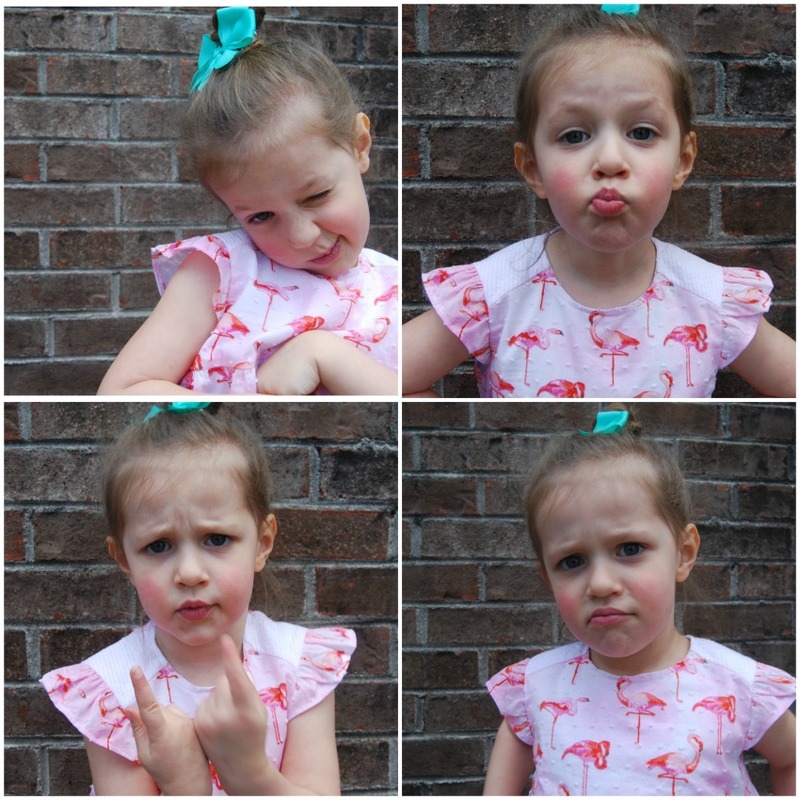 We took these photos on an almost 80 degree day and she was sweaty afterward. She could wear this thing in the snow. Here are a few more things I made for the growing belly this summer. All of these were for back to work. I've worn the shirt dresses a bunch of times already, but haven't worn the separate pieces at all. The best part about all of these pieces is that they don't look like maternity clothes (I think?) and I definitely plan to wear them after baby is here. The shirt dresses in particular will come in handy when I have to go back to work after giving birth. Don't ask me why I seem so prepared for all of this baby business! I'm really not. At least I'm not prepared in any other aspect of life. But I guess my wardrobe is prepared. Ha! 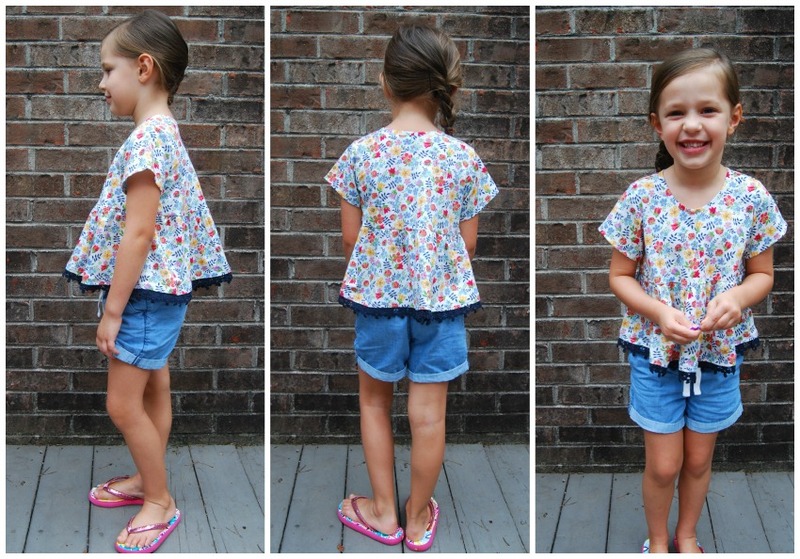 I did get all summer to think about what to sew and then had the time to do it, so that helped. Pattern Description: The pattern is one I've made before, McCalls 7314. 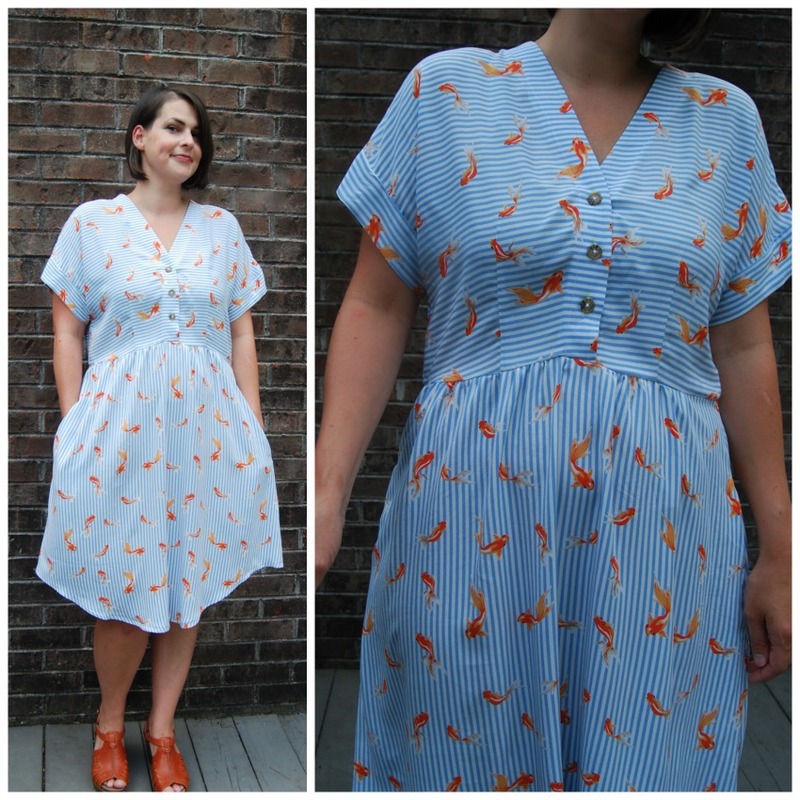 In fact, when I blogged about this particular dress before, I actually noted that it would be a great maternity pattern. And it is! 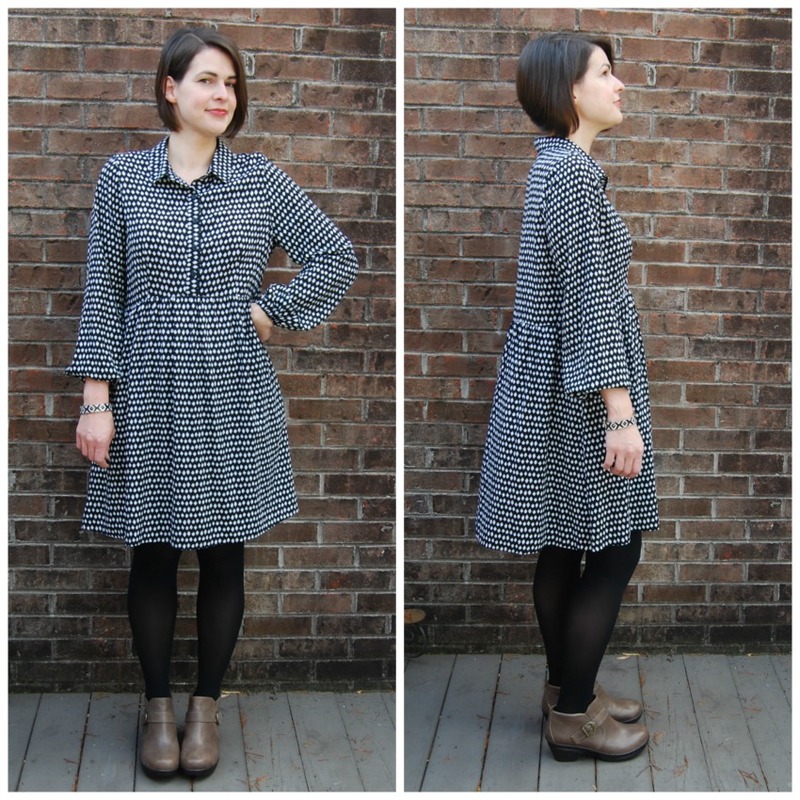 It's a typical shirtwaist dress but with a raised, curved waist seam. It's perfect for a growing bump. And I will absolutely be wearing my very first version when the weather gets a little cooler (it's below). I left the elastic out of the back waist in that version but I like how it looks with tights and boots. The sleeves are from a different pattern. Pattern Sizing: 6-22. I made a 14. 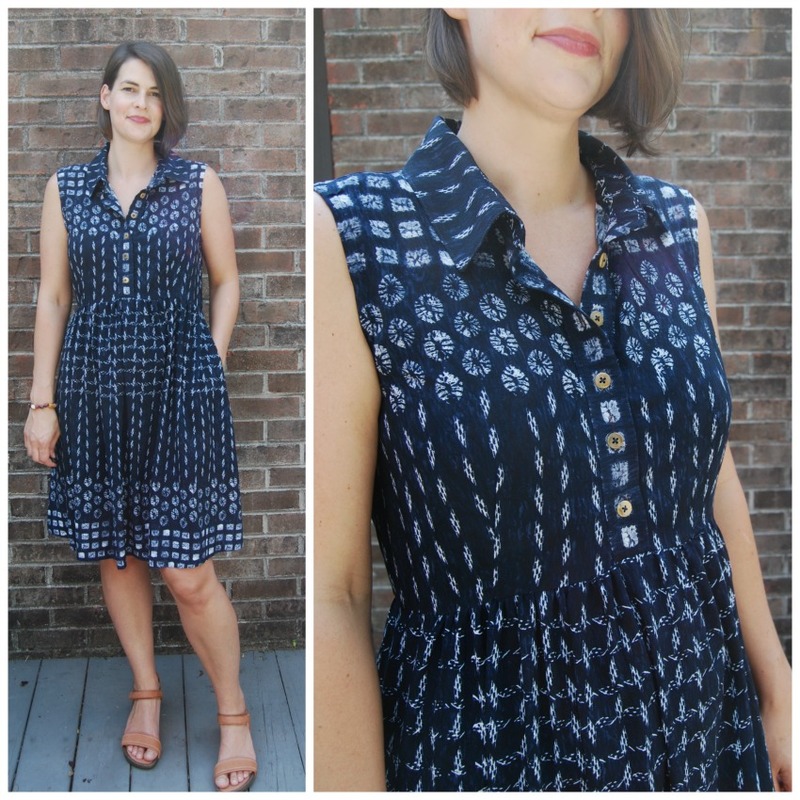 Fabric Used: I made the navy, shibori print dress first. It's a rayon poplin that I bought from fabric.com a while back. I've seen many other folks with the same fabric and for good reason. It's really nice stuff. 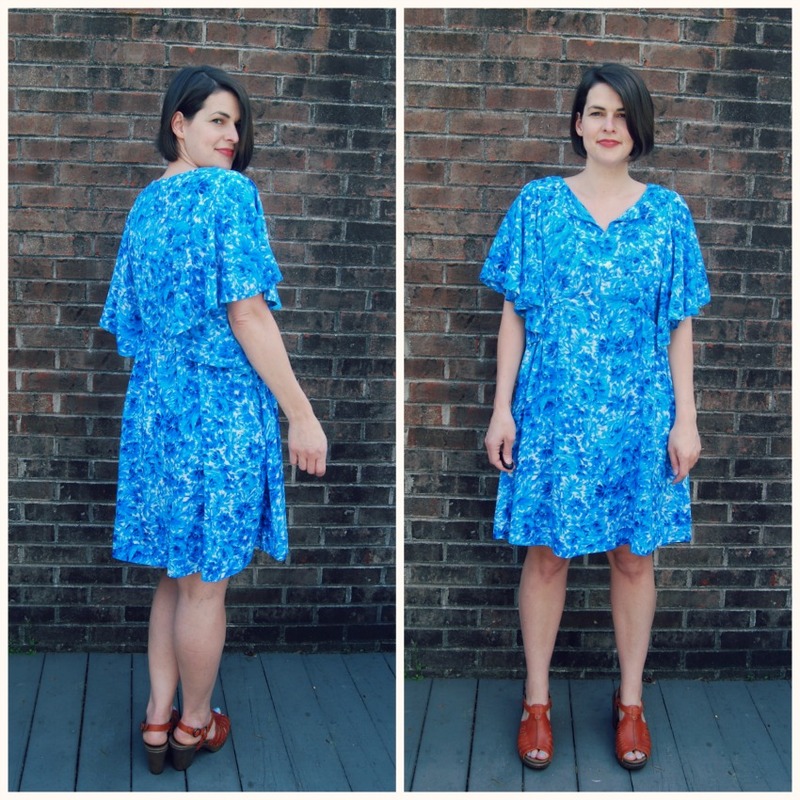 I think rayon poplin might be my favorite dress fabric. 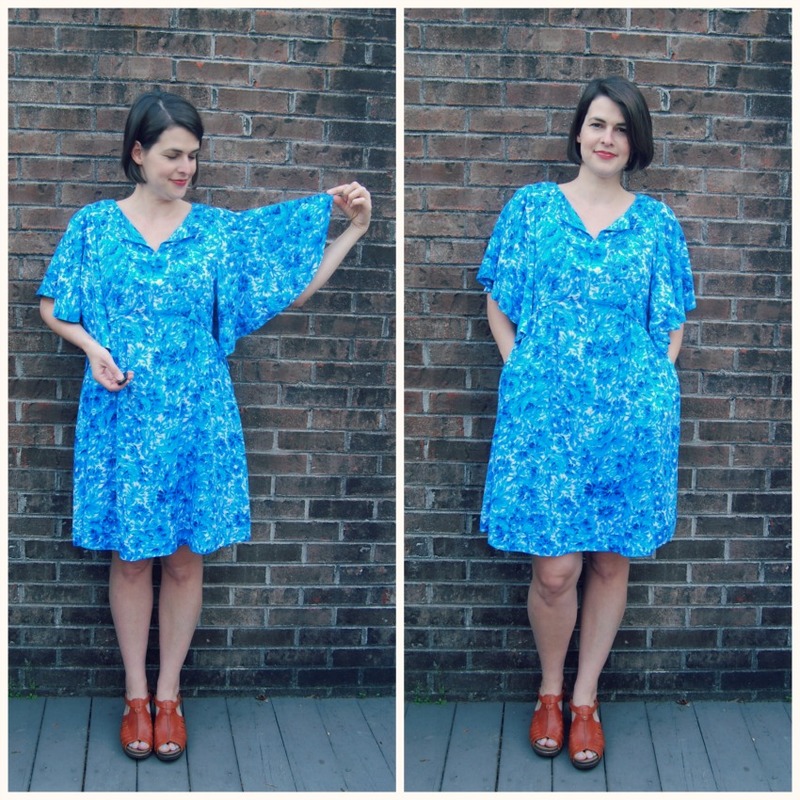 It's got great drape but is way sturdier than rayon challis and totally opaque. I made the black and white gingham version next. It is a rayon challis I've had for a while, too. The top version is a plain white rayon challis that I bought yards of when Hancock closed down. And the pants are made from the leftover rayon poplin from my very first version of the dress above. I'm trying to sew through some of my stash as my fabric closet is going to be new baby's closet. I've got to downsize! I'll make some quick notes about the pants at the bottom of this post. 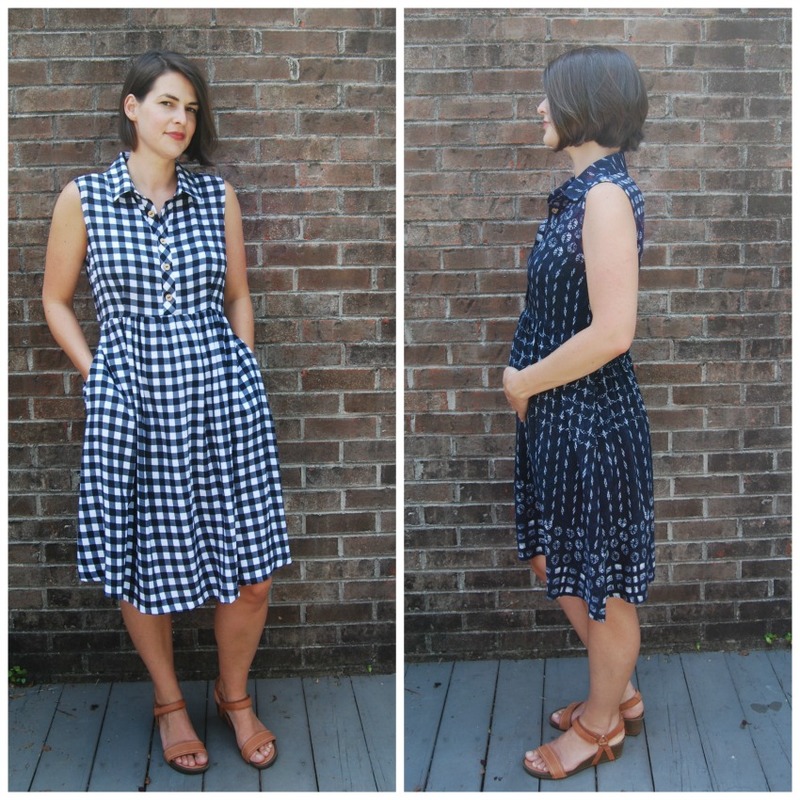 Alterations/ Deviations: The navy shibori print dress has almost no alterations except my standard square shoulder adjustment. I played around with the shoulder fit more on the gingham version (and the armscye), but honestly, I think the shoulders look better on the navy version. I also played around with button placement on the gingham version but I like it better per the pattern. 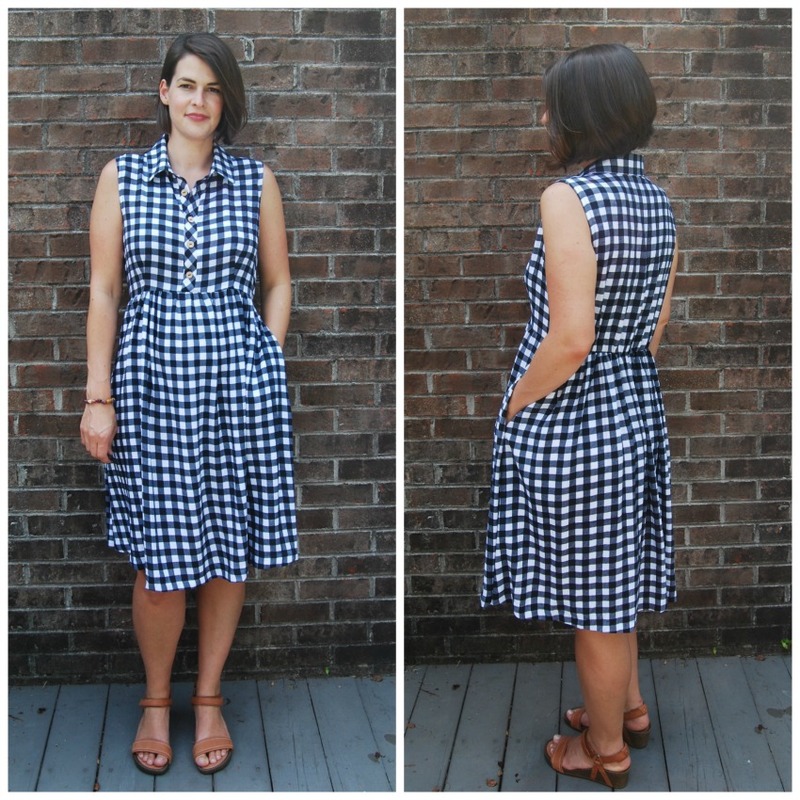 The gingham dress is longer, too. About three inches, I think. I spent forever matching up the checks on the gingham when I cut out pattern pieces. The bodice looks decent but there is a little slant to the skirt. Oh well. It was not fun to cut out. I made the blouse last. It's okay. I put the elastic in the back waist of both dresses but did not like it in the top version. So I left it loose and billowy. The top version seems to fit so much larger for some reason. Maybe fabric choice- cheap fabric, looser weave. Likes/ Dislikes: I love both dress versions. The curved waist seam is just perfect for a belly. I plan to wear both dresses after baby, too. I'm hoping the buttons will make it nursing friendly. Like I said before, the blouse and pants haven't been worn at all. I think I like both pieces separately, but not together. It's too much fabric to wear at once. I'll wear the blouse with a skinnier bottom but I'll probably just save the pants for later. You can't tell in these photos, but the blouse has fun buttons. They are clear with glitter. And just some quick notes about the pants: They are Butterick 5893. I made view A, the straight leg version with side seam pockets. I cropped mine. I also shortened the rise a little bit. They have an elastic waist. They feel nice to wear in rayon poplin again, but I'm not sure what sort of top to wear them with. I'll have to figure it out. 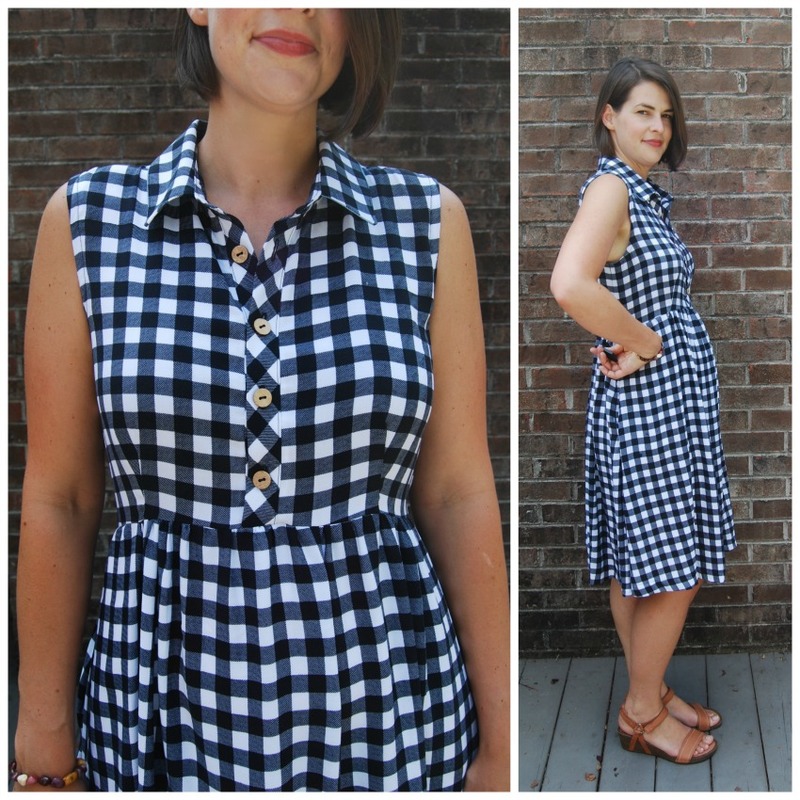 Conclusion: Great shirt waist dress pattern. 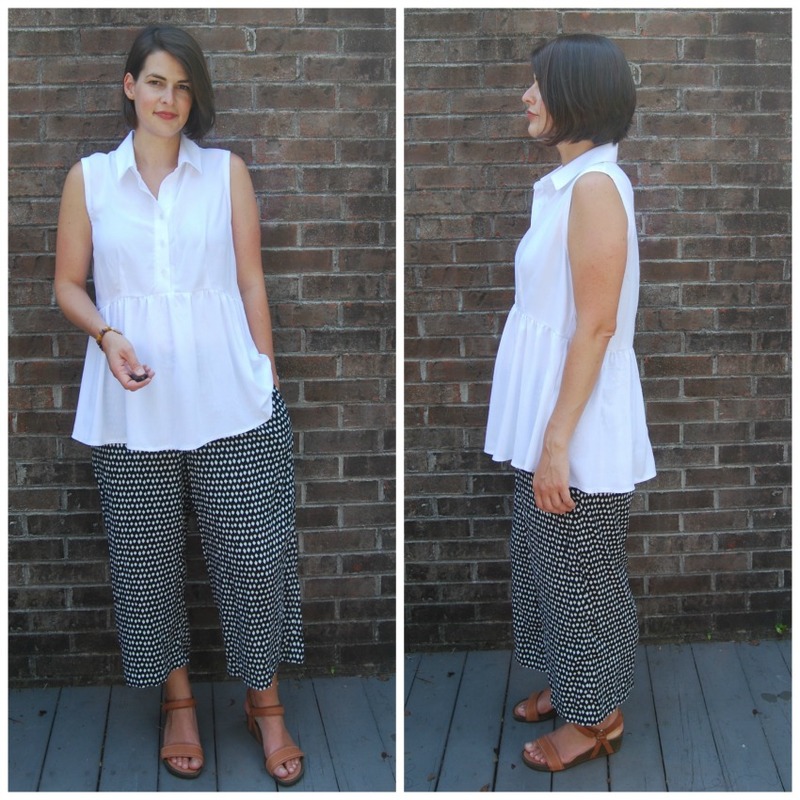 Perfect for summer and also happens to be perfect for early maternity wear! I took these photos the same time I took the photos for my last post. So this is just a 15 week little baby bump. It's getting bigger now. 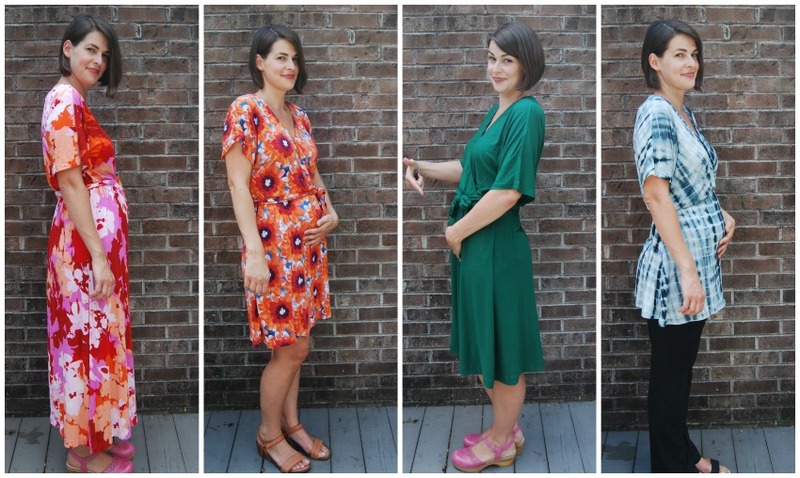 I think it's time to look at actual maternity patterns and for colder weather, too. Baby! Yes, baby number 2 is on it's way. I found out I was pregnant the second day of summer vacation (I'm a teacher) and have spent the whole summer taking it very easy. It was fabulous. I thought my timing with my daughter was great before. I had her in April and got to stay out the rest of the school year. But I think this timing is even better as I got to spend my entire first trimester at home. I'm back at work now but it's going well. Baby is due early February. I will have to go back to work the last month of school or so (womp, womp - American maternity leave). But then I'll get all of next summer, too. I've felt like my baby bump is enormous this time around, but looking at these photos I realize it's not. Ha! It's just a little bump. 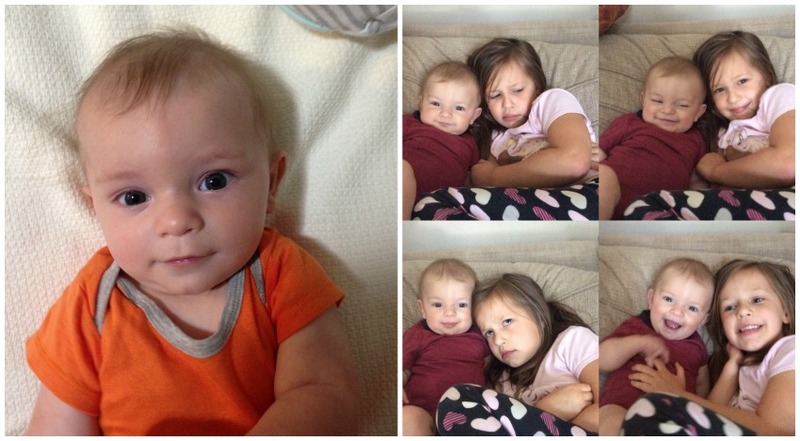 I took these photos a couple of weeks ago so I think I was around 15 weeks at that time. I am a little bigger now! We still don't know it it's a boy or girl yet, but we'll find out in a few weeks. Jane says she wants a little brother, believe it or not. 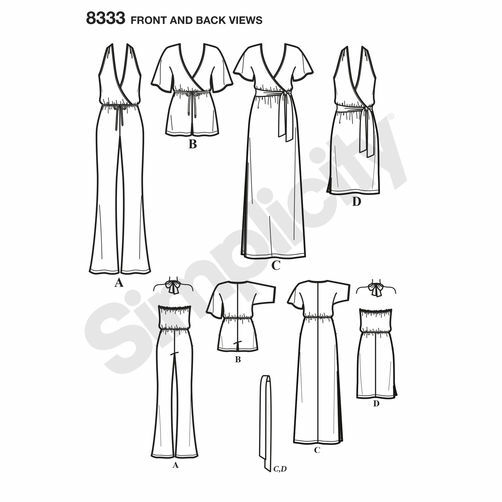 Pattern Description: The pattern is Simplicity 8333, a jumpsuit/dress pattern with a crossover bodice for knit fabrics. I thought it looked like an easy pattern for summer when I first decided to make it. Sizing: 4-20. I made a 12. I am typically a 14 but I usually size down when I make a knit pattern. Fabric Used: All knits, of course, but different knits behaved differently. My favorites are the orange dress and the red/pink longer dress. Those knits are a rayon blend and had strong recovery. 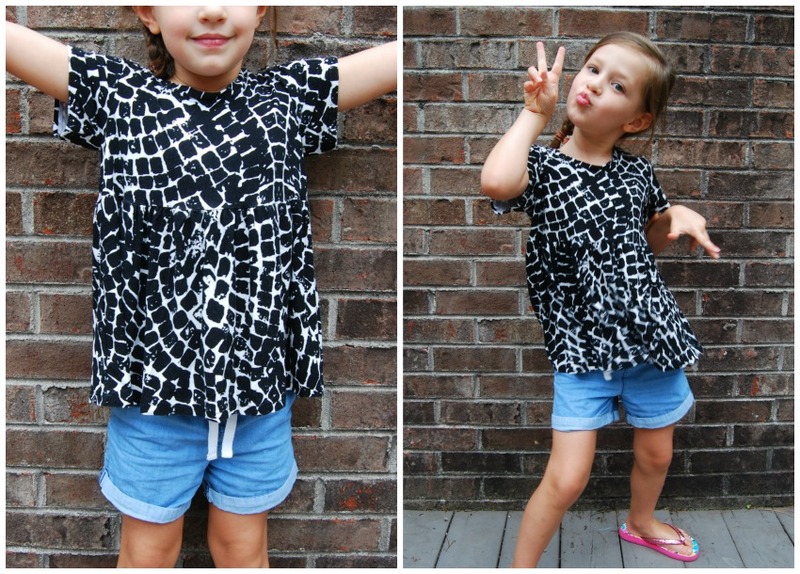 The black and white tie-dye top is a bamboo knit from fabric.com. I works well for a top but would be too drape-y for a dress. The green version is my least favorite. 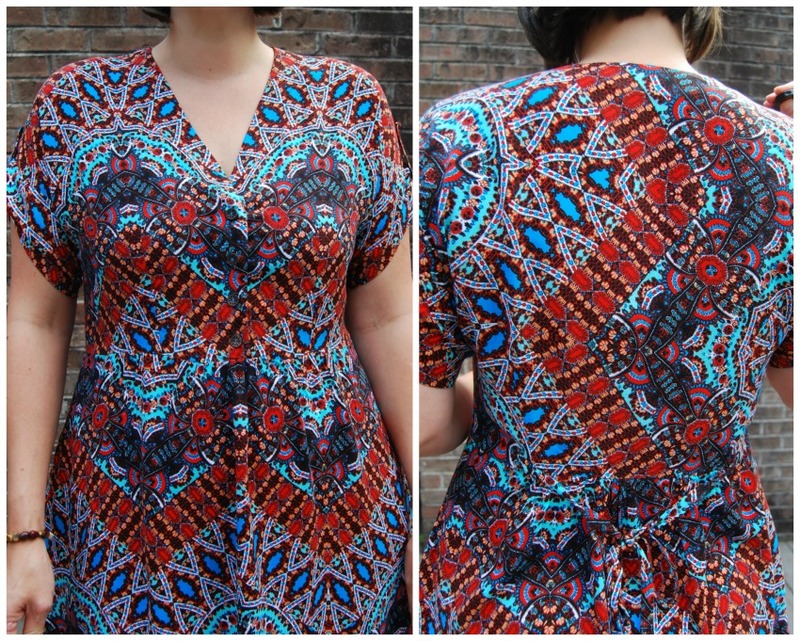 It's a rayon jersey (Dakota jersey from fabric.com) and is too thin and wrinkly. I think maybe it's a cotton/rayon blend? Can't remember. Anyway, I like well enough but I think it looks sloppier than the others. Likes/Dislikes: I love the bodice with the cut on sleeve. It's the main reason I made these. The skirt is modified from the get-go. When I cut the pattern, I noticed that the skirt pattern piece was just a perfectly straight rectangle which does not work for someone with saddle-baggy hips like myself. So I used the top of the rectangle as a guide and made it in to a-line shape to accommodate my hip measurement. They all have pockets except for the top version. I know people don't like pockets in jersey, but I love pockets no matter what. Alterations/Deviations: In addition to the skirt modification I mentioned above, I also added elastic in to the neckline of all versions. When I sewed on the neck binding, I threaded a long piece of 1/4" elastic through the binding like a casing. I pulled the elastic slightly and sewed at the shoulder seams so the back neckline is nice and taut. I just pulled the elastic ever so slightly at the front bodice to keep a little tension on the front neckline before sewing the bodice to the skirt. It worked well on all versions except the green one (because the knit is so droopy). I'm so pleased with the elastic in the neckline because that neckline is not going anywhere! I also sewed one snap at the front where the bodice pieces crossover to hold in place. My plan is to also wear these dresses after pregnancy while I'm nursing. The elastic should keep everything from stretching out and I can undo the snap easily. I cut all the back bodice pieces on the fold, too, except for the red/pink version due to amount of fabric. All the dresses have hem and sleeve length differences, too. 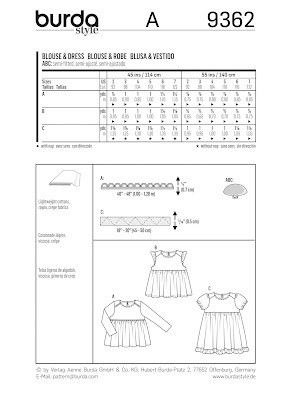 The orange dress is the shorter sleeve in the pattern and the skirt length is per the pattern plus one inch. So it's a pretty short skirt as is, fyi. The green dress I cut the longer sleeve and added several inches to the hem thinking I would wear this one to work. I made the top version next. And then the pink/red version is about ankle length because that was every bit of fabric I had. That fabric is one I bought when Hancock was closing down. I miss Hancock! Conclusion: Nice, easy knit dress pattern. Perfect for a growing bump, but I stress growing. The elastic waist does hit the top of my belly and I know once my mid-section gets a little bigger I won't want to wear any of these as is. Maybe with a raised and curved waist it would work for an entire pregnancy. These are some serious sleeves, again! I guess it really is 'the year of the sleeve.' Or am I behind a year? I usually am. Anyway, I made this dress back in April for Easter. I actually took photos then, too, but have not even thought about blogging until now. Why now, do you ask? Schools out! Glorious free time! Woo hoo! Today was my last workday for the next nine weeks. I love summer!! 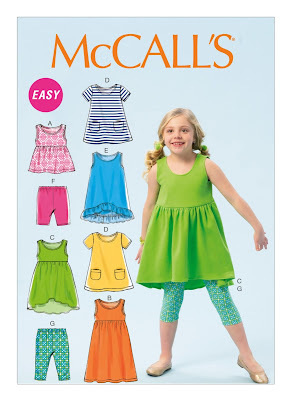 Pattern Description: McCalls 7385. I made view C but with the awesome circular flutter sleeves. I've had this pattern for a while. I have seen a few sleeveless versions but not any with the big sleeves. I now see why the giant sleeves are only on the shirt view, though. A whole lotta fabric went in to this dress. Five yards. Yes, five! I lined the sleeves and bodice. And while I like the end result just fine, I do feel like I'm being swallowed up by all that fabric. Pattern Sizing: 6-22. I made a 14 but I do believe I nipped it in a bit. It's been while since I made it, so it's hard to remember everything I did. Fabric Used: A rayon challis, I believe this is from Gertie's line of fabrics at Joann's. I really, really tried to shop my stash but didn't have anything spring-y for Easter. So I went to Joann's just to browse and this electric blue floral print jumped out at me. It's not a style I would typically go for but I think it works with the dress. And I felt nice and bright and springlike when I wore it. I am a little concerned about the longevity of the fabric. I had a lot of trouble with warping and stretching out while I was sewing. I guess that means the weave is looser. It's nice and swishy, though. On the downside, you really can't see any of my seam lines in this busy print. Likes/Dislikes: I like the lines of this pattern. The gathering on the side is nice and I like that it doesn't continue across the center front. I like the raised waist. It hits me at my smallest measurement. I also like the split neck. I do have a little bit of pulling at the split towards my shoulders. Typical issue for me. I think I squared the shoulders some, but can't remember. I usually do. The split neck should be lined in the pattern instruction but it's not. It stays open and you would see the wrong side of the fabric all the time. Luckily I read a couple of reviews of the pattern, including Carolyn's, so I planned ahead and lined the whole bodice- front, back and side pieces. The original instructions have you line just the side front and back to get a clean edge on the armholes. Alterations/Deviations: Like I said above, I lined the whole bodice. I used all the same pattern pieces, cutting the center front at the waistline. I also self-lined the sleeves. I put one sleeve on as a single layer but didn't like seeing the wrong side of the fabric. So I cut two sets of sleeves and stitched together at the hem before sewing them to the armscye. Those sleeve pieces are fabric eaters! Saved me from having to hem that giant circle, though. I added interfacing to some areas on the bodice after the fact as I was sewing. 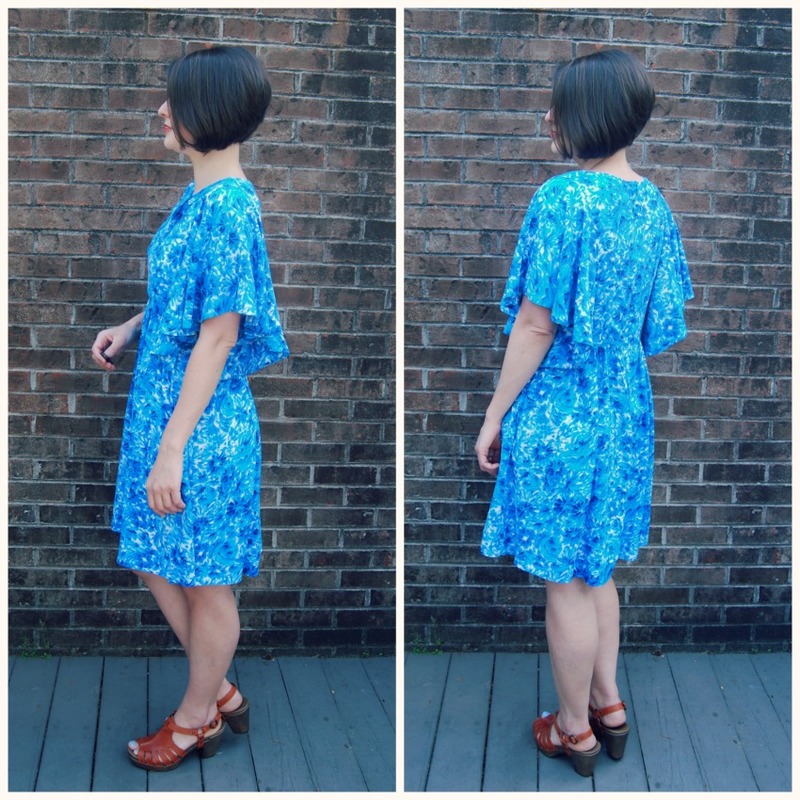 The pattern doesn't call for any interfacing, but I think you need some if you are using a floppy fabric like rayon challis. I interfaced the front edges of the split (shell and lining) and around the neckline. Like I said before, I was having some trouble with warping and this was my solution. I added side seam pockets, too. I love shoving my hands in my pockets. The finished dress was also pretty short. You probably can't tell, but I used my last little scrap of fabric to add a hem band to the bottom of the skirt. 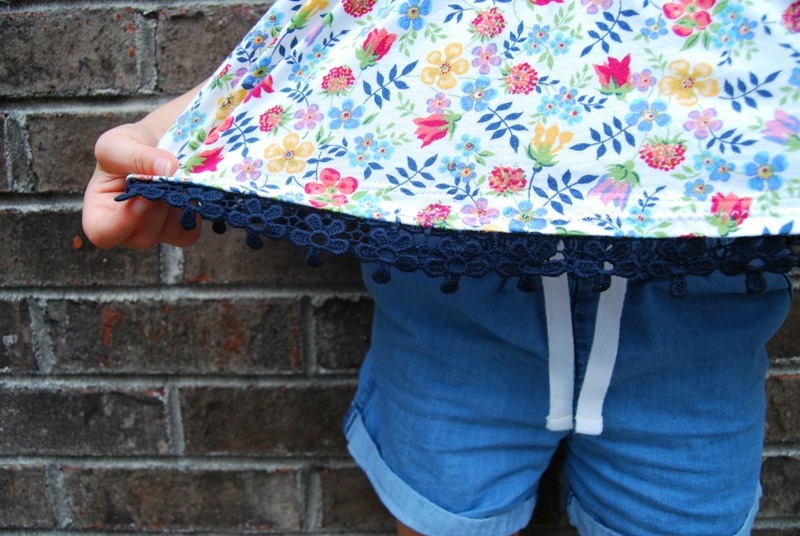 For length, but also to add a little bit of weight to the skirt. With all the lining on the bodice and sleeves, the dress is pretty top heavy. I probably should have lined the whole dress in a lining fabric, minus the front neck split. Conclusion: I enjoyed wearing my new dress. I like the cut of the dress even if it gets overshadowed by those massive sleeves. I'd love to make the maxi version this summer though sleeveless for sure. The front slit on the maxi view is calling my name. If I make those big sleeves again, I'll stick with just a top version. The title says it all! I've done quite a bit for the girl here lately, so here it is all in one post. First up is the dress. 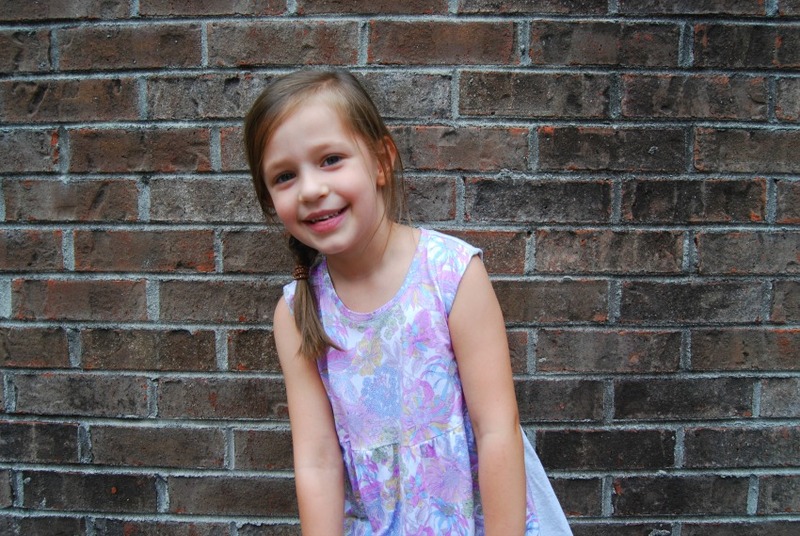 Jane had picture day at school a month or so ago. I decided to make her a dress for the occasion. I'm so glad I sew. The pattern is Burda envelope pattern 9362. 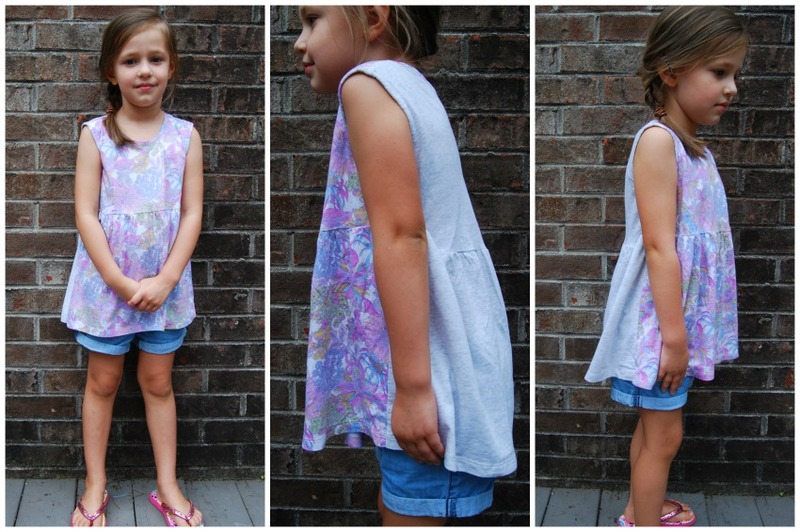 I've made a few Burda kids patterns now and I'm always pleased with the fit. It seems pretty accurate. I made a size 4, which is what Jane wears in rtw. The shoulder fit and overall width is just right. 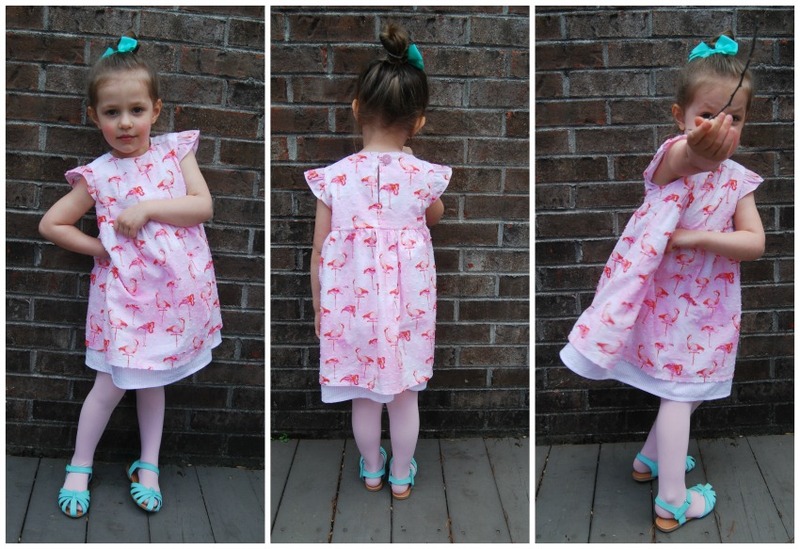 I made the dress, sans ruffle, but with the flutter sleeves. 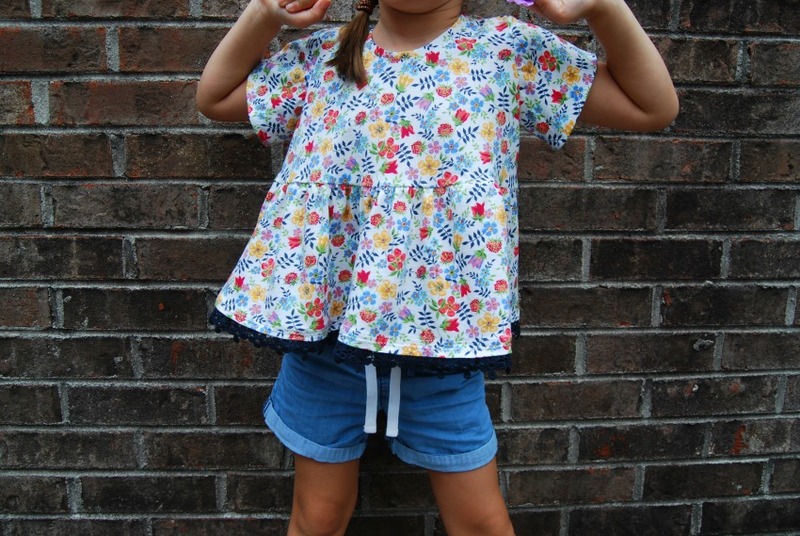 I love those little flutter sleeves. 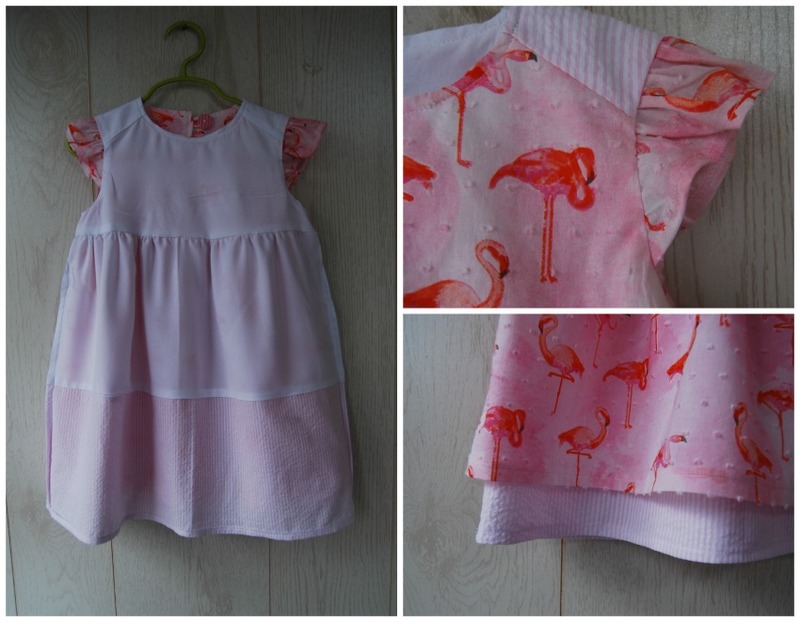 I used a swiss dot printed with flamingos (flamingoes?) that I found at Joann's. I had the pink seersucker in the stash from years ago. This dress is pretty simple but I went a little fancy with the finishing. I lined the whole thing with white rayon challis I had. The swiss dot definitely needed a lining. I wanted to do a two layer skirt with the pink seersucker but was worried it would be too stiff for the gathering at the waist- hence the two piece skirt lining below. It's a very cute little pattern. 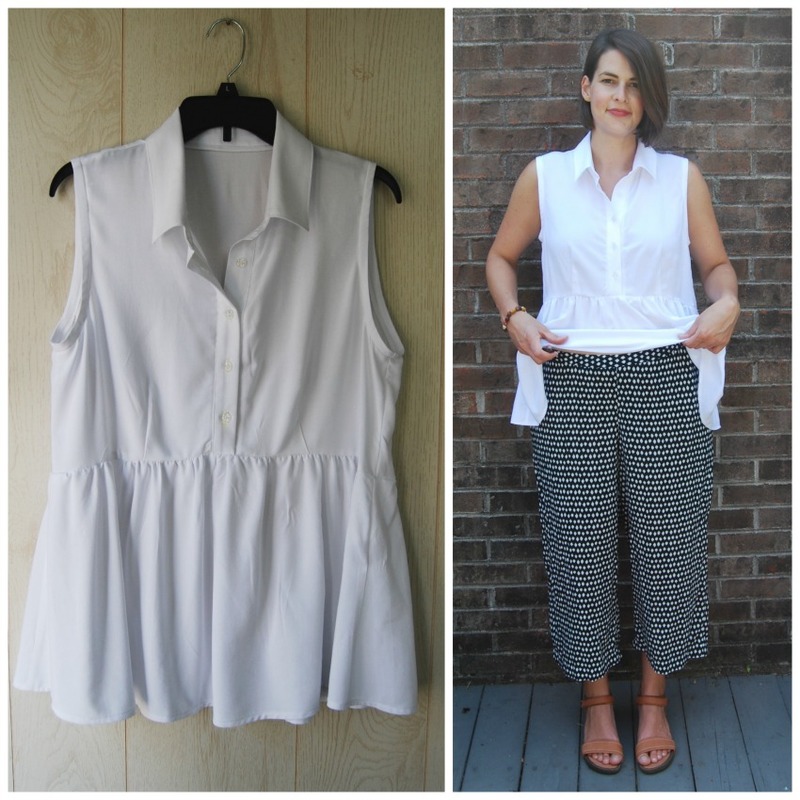 I plan on making the top version soon with some leftover rayon. Jane seems pleased with it, too, though she refused to take any serious photos. 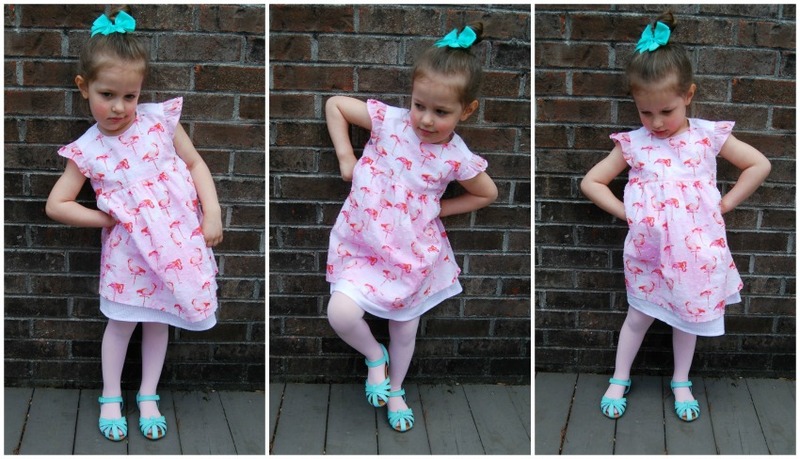 These are some of her modeling poses below. She'll get lots of use out of this dress over the summer. 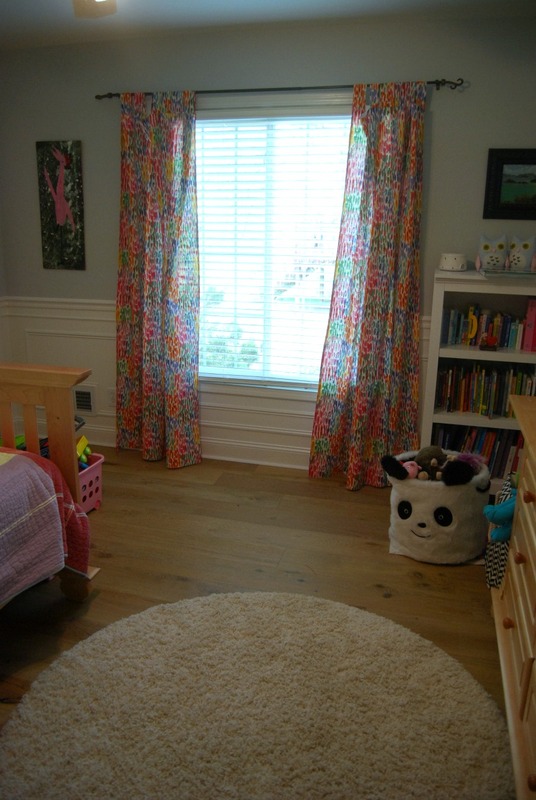 Next up is a set of curtains I sewed for Jane's room. She has officially switched over to a big girl room :( I tried to keep her in that toddler bed as long as I could. But she's in her big girl bed and loving it. I made her curtains and some bedding before she was born (see here and here). The curtain fabric faded like crazy in the sun (we originally didn't have blinds up) so I figured it was time for some new ones. 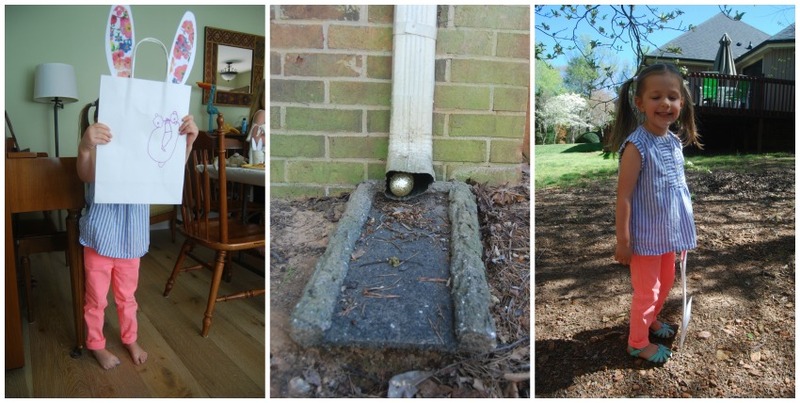 Also, see birthday party eggstravaganza below-- we went a little nuts doing some home improvement stuff because we knew we'd have lots of guest over for her birthday party. I waffled over different color schemes for her room but ultimately we went with rainbow. I mean, who doesn't love rainbows? Jane loves her rainbow curtains and now I don't have to worry about anything matching, so it's a win-win. I found this fabric on fabric.com and it's just perfect. Hopefully it doesn't fade too bad. The curtains are just a simple tab top. We actually are planning on raising that curtain rod a couple of inches but haven't gotten around to it yet. I didn't order quite enough fabric for the length we needed so I used a leftover piece of fabric from her baby bedding as a hem facing, which is my favorite part. 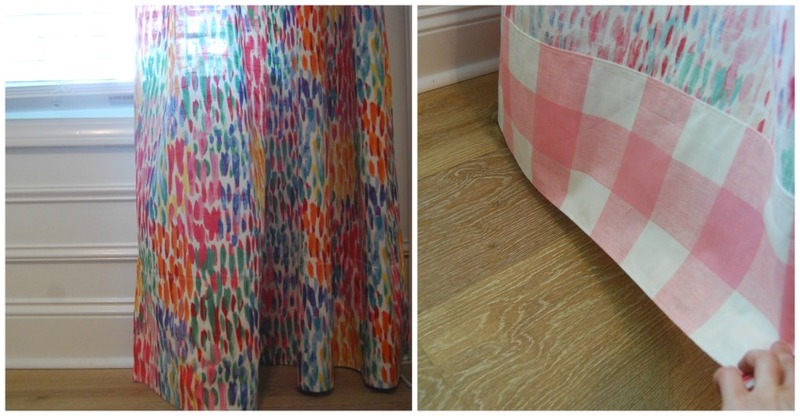 I know curtains are a boring sewing project but I like seeing other peoples home decor sewing, so there you go. I couldn't figure out a good time of day to take a photo so it's little dark. But for posterity, above is Jane's room somewhat clean right before her birthday party. Hasn't looked like this since! Jane's fourth birthday party was great fun. She is obsessed with these crazy surprise egg videos on YouTube. I'm not sure what the pull is, but she would watch them over and over again if I let her. So we decided to have an EGGstravangza birthday party, complete with egg crafts, egg themed food and an egg hunt of course. It also happened to be the weekend before Easter. Somebody should have restricted me from Pinterest beforehand. 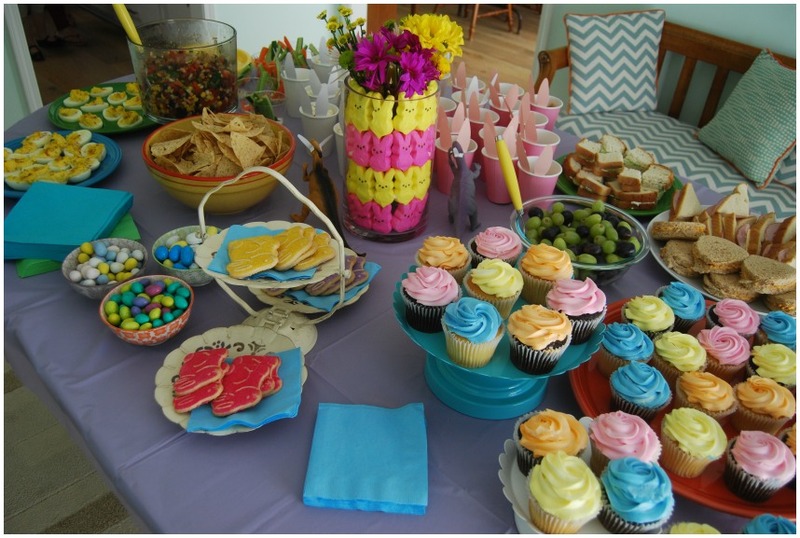 Pinterest gets full credit for the peep centerpiece and bunny cups. So much work! It's funny how a 'little get-together' can turn in to something so crazy. I'm glad I snapped a pic of the spread before it was eaten up. Jane helped with a lot of the prep. 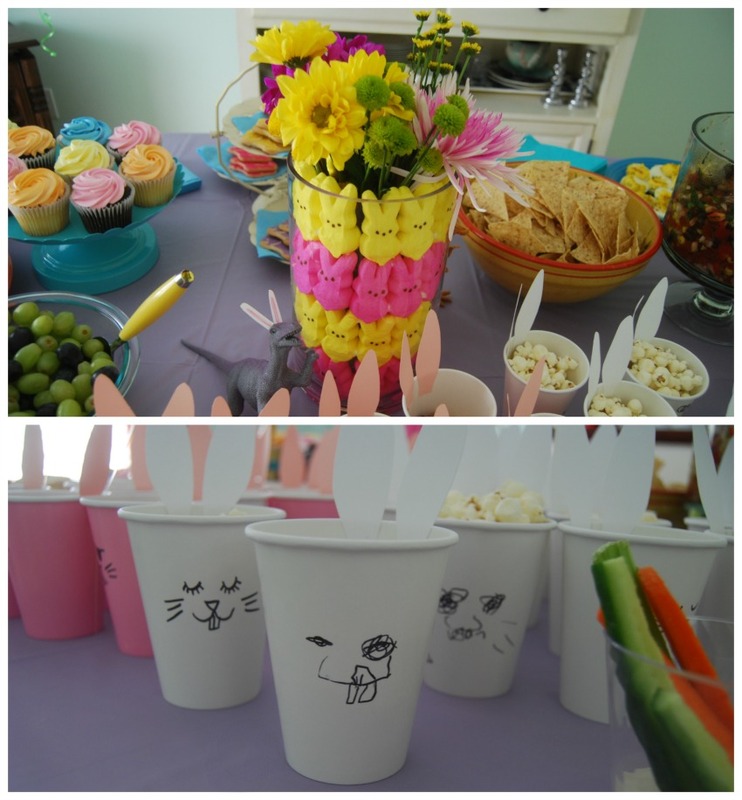 She did some of the faces on the bunny cups (my favorite!) and helped set up the craft table and made examples. It was fun having a helper. We made an egg scratch board and little bunnies using plastic eggs and pipe cleaners. I promise there were other kids there but didn't want to post pics without permission, so you just get Jane. We also made those bunny bags for the egg hunt. She had a ball. This girl. I can't believe she's four! Everyone told me it goes by fast but I had no idea. She is just so much fun, uncooperative camera faces and all.